If you missed either – or both – of these events as I did, you might wonder what it is like to travel in a confined space in open carriages pulled by a steam locomotive. 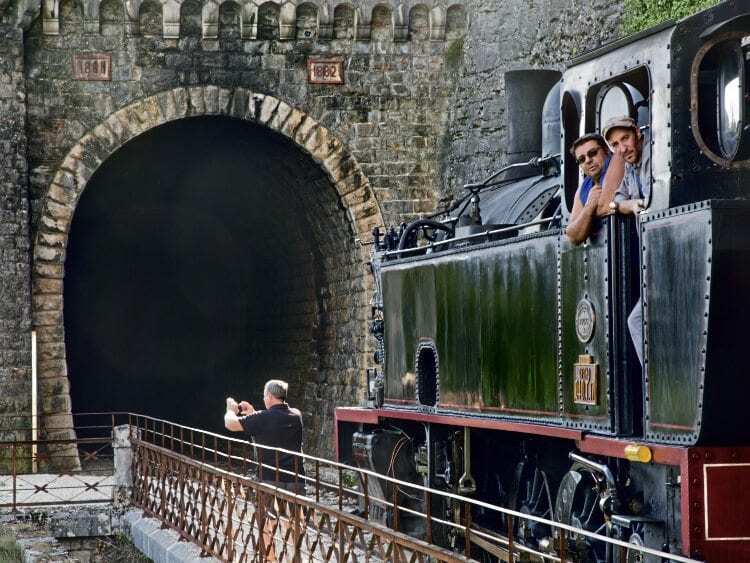 Well, make your way to the Lot Département of France and climb aboard the little steam train known as ‘Le Truffadou’ where you can experience just that, and I can assure you it is both interesting and challenging as the train makes it way through long smoke-filled tunnels. Phrases like ‘it would never be allowed in Britain’ immediately come to mind, given our perceived obsession with health and safety. This photo stop location between the tunnels provides views of the Dordogne valley. France has never embraced heritage railways on the scale we have in Britain, so there are relatively few opportunities to savour my favourite mix of steam smoke and hot oil. Visiting l’Association du Chemin de fer Touristique du Haut-Quercy was, therefore, one of the few ‘must see’ destinations pencilled in to our itinerary for a trip to south-west France. In many respects, Martel station reminded me of British heritage lines 30 years ago, before close access to the locomotives in the yards at most lines was blocked by fences and other barriers. Barriers do exist, however, as for some odd reason, access to the platforms is only permitted a few minutes before the train arrives. No such restrictions are imposed on the train’s return to Martel, especially if you have travelled on the last train of the day. The line, originally from Saint-Denis-près-Martel to Souillac, was built in the early 1880s as part of a line between Toulouse and Paris to carry, among other things, timber for making wine casks and truffles, for which the Martel area was famous throughout France. It was in direct competition with the ‘gabares’ – the flat-bottomed boats which plied the same trade along the Dordogne river, but the railway could, of course, deliver those goods much faster. So successful was it in the early years, however, the line soon proved insufficient to meet the demands being placed on it and when a more direct double-track route between Souillac and Brive was opened, traffic fell dramatically. By the time of the First World War it had largely been abandoned and its rails were lifted and transported to northern France where they were re-laid by the American army to form a military supply line. After the war, the Americans re-laid the track – this time using rails imported from America, and those metals survive to this day. Restoration of former DB 2-10-0 No. 50.3661 will be a massive undertaking, having been stored in a tunnel and robbed of parts. It arrived in Martel on June 20, 2007. All pictures by author. While the main Paris to Toulouse line prospered on the opposite side of the river – which includes a fine 1863 bridge designed by Gustave Eiffel – ‘Le Truffadou’ never really achieved the potential of which its original builders had dreamed. Traffic continued to decline, and had it not been for the outbreak of the Second World War, the route might have been abandoned completely. Its continued use was down to the French Resistance, who derailed a heavy locomotive on the main line and thus blocked access to Eiffel’s bridge. Traffic, once again, had to use ‘Le Truffadou’ – but traffic on a scale for which it had never been designed. The line had steep gradients – 1-in-50 in places – so the 40 or 50 heavy trains which re-routed along it every day required two, and sometimes three, heavy locomotives pulling at the front, and a banker engine at the rear. It is a testament to the robustness of the original construction that it could cope with such traffic. After the war, the route continued to be used for both freight and local passenger traffic, but by the 1970s, this was down to no more than two or three trains a day, and even that ceased in May 1980 when the line was finally closed down. It remained abandoned for nearly 12 years before being rescued by the preservation society, and just five years after it was taken over, paying passengers once again savoured its delights in the summer of 1997. A view from the train as No. T17 crosses the seven-arch Courtils viaduct. 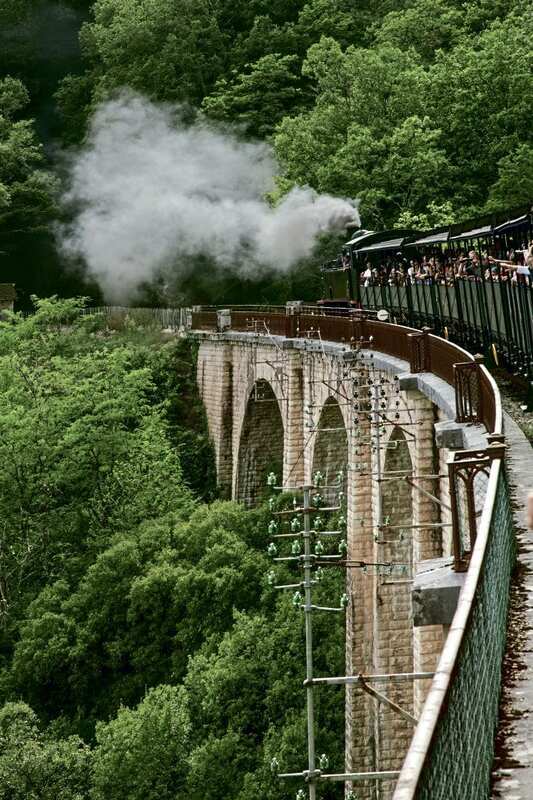 The route of the single-track railway takes it alongside the Dordogne for some of its way, but running high above the river on a ledge hewn out of the cliff face, through several tunnels, and across a spectacular viaduct. Part of the line, with its spectacular views down to the valley floor, reminded me of the narrow-gauge Kalka to Shimla mountain railway in northern India, which I had the pleasure to experience a few years ago. Perhaps, in Britain, restoring and then maintaining lines with such complex infrastructures might have seemed too daunting a task, but that is the challenge to which l’Association du Chemin de fer Touristique du Haut-Quercy rose in 1991. Nearly a quarter of a century later, the railway is still a ‘work in progress’, and at the time of writing the installation of a turntable at St Denis is nearing completion. Trains are currently pushed from Martel to St Denis and pulled back to Martel. The new installation will allow them to be pulled both ways, which will be a bonus for photographers, but a mixed blessing for passengers – currently, on the outward journey, the smoke is always behind the train so passing through the longest of the tunnels is a much less challenging experience. 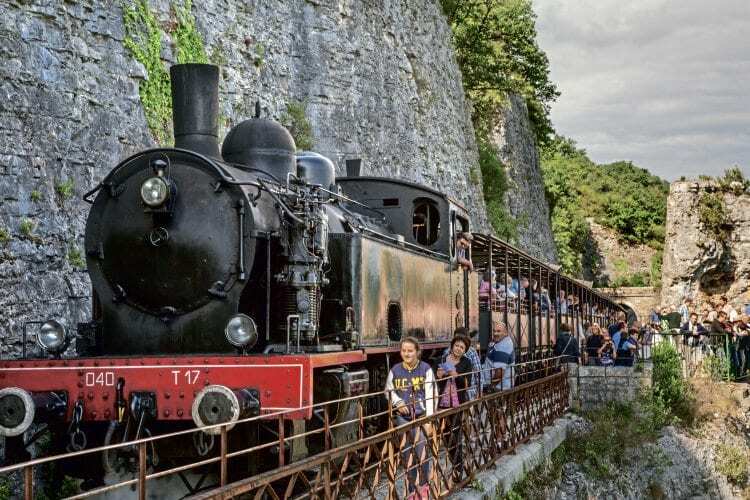 On the way back, there is quite a lot of coughing, especially when the train emerges from its slow traverse through the half-mile-long Mirandol tunnel, the longest of the five on the line. Motive power is currently provided by a mixture of steam locomotives and diesels, with two locos sharing the honours on the steam trains. On our visit, we were hauled by a powerful side tank 0-8-0T (040 T-class) locomotive, built in 1927 by the Société Alsacienne de Constructions Mécaniques (known as SACM) in Illkirch-Graffenstaden, north-eastern France. Behind it were seven open passenger cars, capable of carrying between 400 and 500 people in total, and on a Sunday in mid-September, it was almost at capacity. Société Alsacienne de Constructions Mécaniques (known as SACM) 0-8-0T T17 approaches the station from the yard, passing two ex-SNCF 63000 class switchers. Sometimes the steam trains are hauled by the smaller Polish 0-6-0T ‘TKh’ No. 5703, known as Marine, built in 1961 by Felix Dzerzhinsky in Chrzanów. 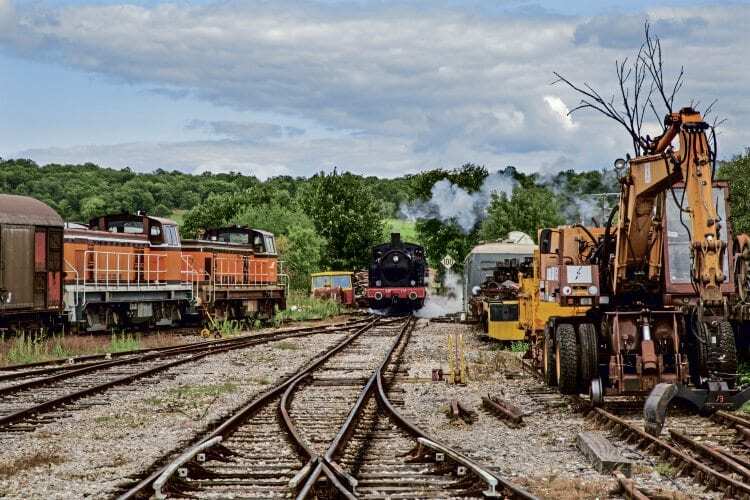 Originally constructed to work the yards at a potato-glue factory in Poland, the locomotive was decommissioned in 1991 and eventually sold to the Haut-Quercy railway in 2000. ‘TKp’ No. 6281 and the 1955-built ‘TKp’ No. 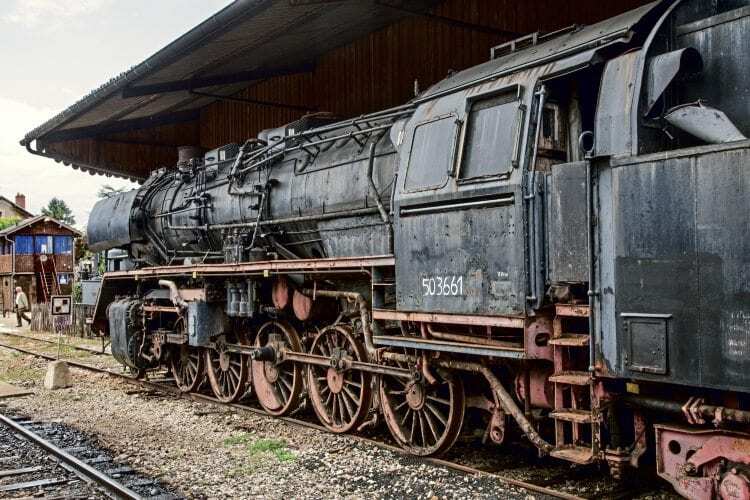 4430, which stands alongside the workshops, both of which are awaiting restoration. Several other interesting locomotives from America, France and Austria can be seen around the site. Largest among them is a 2-10-0 locomotive, former DB No. 50.3361 – built in 1941 by Austria’s premier locomotive builder, Lokomotivfabrik Floridsdorf – which spent most of its working life in East Germany, and was retired long before German reunification. It was acquired by the society in 2007, but restoring it will be a major long-term undertaking. The oldest is Trambouze, a 0-6-0T, built by Schneider et Cie in Le Creuzot, in eastern France, in 1891, and rebuilt in 1922. Schneider et Cie was already renowned for its powerful steam hammers by the 1870s, but built relatively few locomotives, going on to become one of France’s leading manufacturers of armaments. 0-6-0T No. 62.046, built for the US Army in 1943 by H K Porter Inc, of Pittsburgh, a company which specialised in the manufacture of light locomotives, is displayed next to Trambouze, behind the station building. Beyond the end of the station platform, sidings house the diesel locomotives which haul many of the trains, and an assortment of rolling stock – including a jeep, modified to run on rails. The station building is relatively new, having been completed only in 2010, and the interior is a good re-creation of an early 20th century French station booking hall. Above it is the railway’s museum, containing an eclectic collection of ephemera, but we were immediately aware that there was no evidence of a souvenir shop. That, it turned out, is in a little building halfway along the track, where everyone is expected to pile off the train and buy whatever they want in a 10-minute stopover on the return journey. We didn’t join that particular melée. Possibly not the kind of happening you’d see at a UK heritage line. The loco has made a photo stop at the entrance to the Mirandol tunnel. 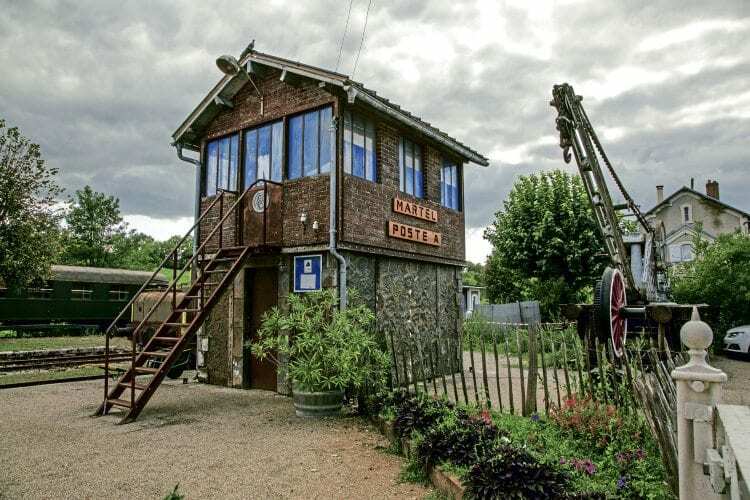 Despite having a pretty authentic look to it, not everything at Martel station is what it seems – the signalbox, which stands at the end of the track, houses nothing more interesting than offices. It is just a façade, built by a film company who used Martel as one of the locations for Effroyables Jardins (Strange Gardens), a 2003 film based on the 2000 novel by Michel Quint about the French resistance during the Second World War. The whole place reminded me of early railway preservation in Britain half a century ago – a ‘work in progress’, which still has a long way to go before it matches up to our heritage railway expectations. It is, nonetheless, well worth a visit. Read more Features, News, Views and Opinion in the July issue of The RM – on sale now!